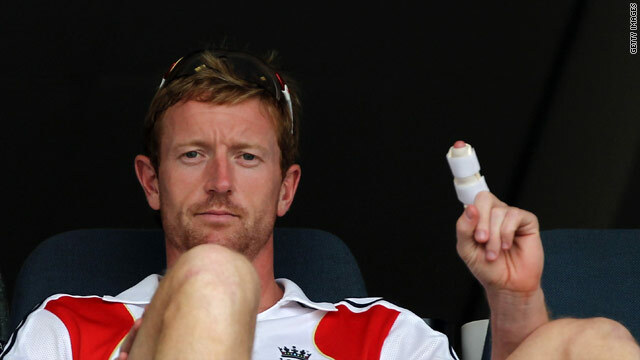 Collingwood shows off his injured finger as he battles to be fit for the third Test in Cape Town. (CNN) -- England will make a late decision on the fitness of key middle order batsman Paul Collingwood ahead of the third Test against South Africa which starts in Cape Town on Sunday. The Durham star dislocated a finger on his left hand in fielding practice during the second Test in Durban in which England triumphed by an innings and 98 runs. Collingwood played a key role in the victory and also in salvaging a draw for his team in the opening match of the four-Test series at Centurion and he would be keenly missed. Uncapped Michael Carberry will probably replace him if he does not come through a net practice on Saturday to the satisfaction of head coach Andy Flower. Collingwood took part in a low-key session on New Year's Day, batting briefly against some gentle bowling and with heavy strapping on his finger. Flower said that his participation in the crucial match was in the balance. "I'd say at the moment it's probably 50-50," he told gathered reporters. But Flower added that he was pleased with Collingwood's progress in battling the injury. "He did more today than I thought he'd do," he added. "That's positive news but we'll do a final fitness test on him tomorrow." South Africa are set to make at least one change to their starting line-up with iconic paceman Makhaya Ntini in the firing line. Ntini won his 101st cap in Durban, but largely proved ineffective and Friedel de Wet, who impressed in the first Test before making way for the returning Dale Steyn, could win another chance. South Africa coach Mickey Arthur hinted at a revamped bowling attack as he briefed reporters on Friday. "We're 1-0 down in the series and we've got to take 20 wickets and win this Test match," he said. He added: "There may be one change, there may be two."